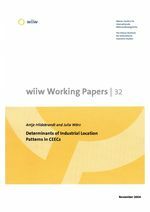 We describe concentration tendencies in individual manufacturing industries in Central and Eastern European countries and identify relevant factors causing these patterns. Using output and employment data for 14 manufacturing industries over the years 1993-2002, we observe an increase in concentration of industrial activity (both in output and employment terms). This is opposed to the general trend prevailing in Western Europe over the same period. Using panel estimation techniques, we explain these developments by factors derived from traditional trade theory (differences in endowments or technologies), new trade theory (expenditure patterns, scale economies) and new economic geography (backward and forward linkages, transport costs). Concentration is driven by differences in human capital and the local concentration of demand. While output concentration is strongly influenced by productivity differentials, concentration of the labour force is strongly related to wage differences. Differences in productivity levels influence output concentration patterns in all industries, while the relevance of other factors varies across industries.